The Belfast boys certainly were determined to make up for last season’s defeat by Linfield at the same stage – and at the same venue. There was never any doubt this time - the Crues were simply a class apart. “I thought we were fantastic . I sensed the boys were up for it,” said Crusaders boss Baxter. “We were motoring at some gear right from the off. “Every time we went into the box, we looked as though we could score – we could have had seven or eight goals. “We’ve been used to applauding teams off at the finish on occasions like this, so I said to the players before hand, it’s our turn to be clapped off. “The players enjoyed the moment . . . it was a great winning feeling. It could well be an historic season for the Shore Road club in terms of a clean sweep of trophies. They currently top the Irish League table and have their eyes on the two top knockout tournaments – the Irish Cup and League Cup. And, they still have an Irn Bru Cup semi-final coming up next month against Inverness Caledonian Thistle in Scotland. The Crues had the game done and dusted after 23 minutes with goals from Howard Beverland, Jordan Owens and Declan Caddell. 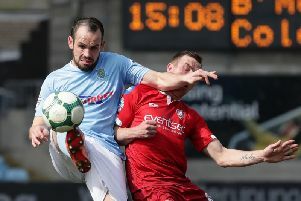 Although they did hit back with second-half goals from Johnny McMurray and Cathair Friel, which came either side of a Paul Heatley strike, the scoreline did flatter David Jeffrey’s boys. The Crues are now unbeaten in 22 goals, which has spanned 101 days. On his team’s chances of completing the clean sweep, Baxter added: “It’s tough, but while we are in five competitions, we’ve now won one of them, you’ve got to give it your best shot. “When you go so far, you try to see it out. There is no doubt, Inverness Caledonian Thistle is going to be a tough, tough for us, especially as we must travel all the way over there. “It could be an historic season for the football club, but we are aware that it’s very fine margins that win games. If we won one trophy, two, three, four or five, I’ll be ultra, ultra, pleased with that bunch of boys I have in the dressing room. United chief David Jeffrey doffed his cap to Crusaders, but admitted his boys were in a generous mood defensively. “We were punished when we made mistakes by a very good side,” he said. “Unfortunately, when we did have a few clear cut chances, we didn’t take them.